That’s the total amount of time people spend watching videos on YouTube every month — nearly an hour for every person in the world. It is also the second most popular search engine in the world, and the third most popular website after Google and Facebook. For businesses, this means big opportunities. YouTube is a powerful medium for branding and traffic. Countless entrepreneurs have leveraged the platform to grow sales. Want to learn how to sell on YouTube? In this post, we’ll do a deep dive into using YouTube for sales. You’ll learn what you need to make YouTube videos, and how to promote your channel. A camera: Pick something that can shoot at least 720p, though 1080p is recommended. Start with a webcam such as Logitech C920 (under $100). If you’re more serious, graduate to a digital camera such as Canon PowerShot 300HS (~$300) or a full-fledged camcorder like Canon Vixia iVis HFG20 (~$700). 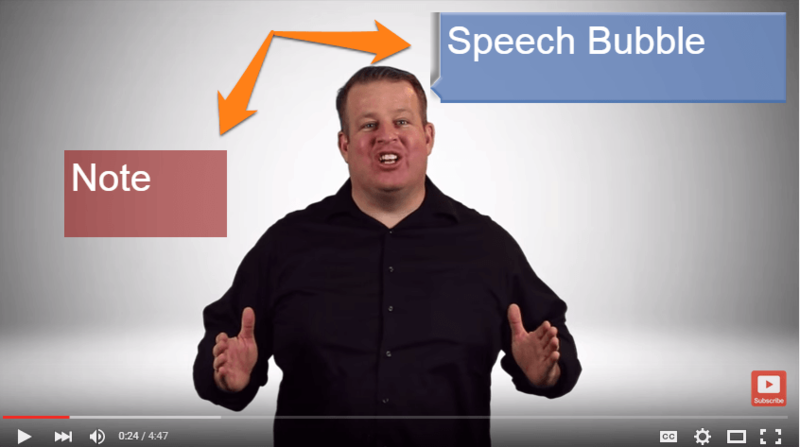 A microphone: A good microphone will have a huge impact on your video quality. Choose a USB microphone for doing voiceovers. If you’re on a budget, pick something like the Samson Go Mic (under $100). For better quality, choose the Blue Yeti USB mic (~$200). If you have a camcorder, buy a shotgun mic from Takstar or Rode for enhanced sound quality. A tripod: Unless you’re using the webcam, you’ll need a tripod to stabilize the video. You can usually find these for under $100, depending on your camera. Lighting: Conventional overhead light casts shadows and isn’t appropriate for YouTube videos. Invest in a simple lighting setup such as the CowboyStudio set (under $100) to make your videos look more professional. Backdrop: You can add some character to your videos by changing the background. A seamless sheet of colored paper works well, but if you’re more serious, get a photography background support stand and colored fabric to match. This shouldn’t cost you more than $100. Video editing software: You likely won’t need any extensive editing features for simple videos. Movie Maker (Windows) or iMovie (Mac) should suffice for most users. If you want more power, try the AVS Video Editor or Adobe Lightworks. 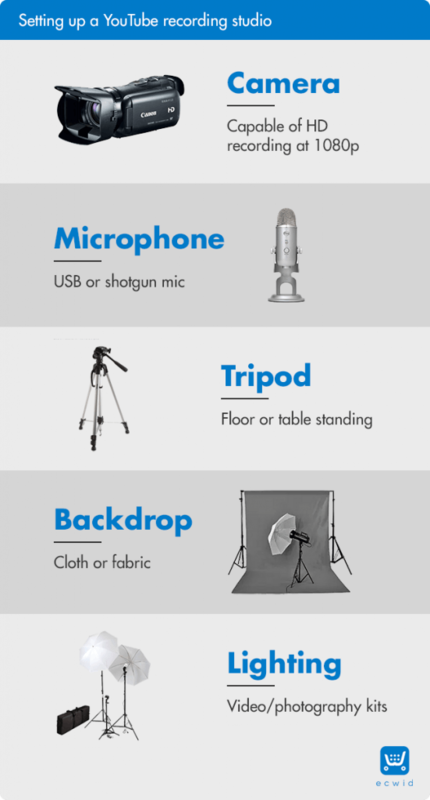 Altogether, you can start with a decent camera, microphone and tripod combo for less than $500. This one should be obvious — you need a website to link to when you make your videos. This can be a blog, or ideally, a product page on your Ecwid store. Depending on your marketing strategy, you can also link out to your profiles on other social networks such as Twitter or Facebook. The best option is to use a dedicated landing page for each video. That is, if your travel accessories business has a video on how to pack your bags like a pro, it should link to a separate landing page on the items mentioned in the video. This requires more work, but you’ll see fantastic conversion rates. It might sound counter-intuitive, but to truly sell on YouTube, you must abandon all expectations of selling. Instead, you must strive to help your viewers by offering them valuable advice. Hard sales tactics almost never work on YouTube; generous advice and entertainment does. Once you have these three requirements, you can jump right in and start making your own videos. The process of selling on YouTube can be broken down into three discrete steps: creating videos, getting traffic and promoting your channel. Let’s look at these three steps in further detail. You can’t really market yourself on YouTube without making your own videos. This can sound like a daunting task, especially if you’re not very comfortable being on camera. However, once you have a decent recording setup (see above) and some ideas, you’ll find that making videos is easier than you think. Your customers will likely have a number of questions about your product, both before and after the sale. Make a list of these questions and answer them via video to make your YouTube e-commerce more effective. You should also monitor social media for additional questions and send out your reply in a video. Think of these as a video version of your FAQs. Behind the scenes videos tend to do really well on YouTube, especially when it comes to branding. If you make your own product, it’s a good idea to show the manufacturing process in detail. It’ll reassure customers of your product’s quality and give viewers a glimpse into your business culture. Behind the scenes and Q&A videos have limited audience potential. Topical industry focused content, however, can reach a much larger viewership. This content should aim to help viewers understand a problem and find solutions. It can also focus on entertaining them with trivia, facts and knowledge. For example, if you sell travel accessories, you can make videos on how to pack your bags better, or share a list of top things to pack before traveling. If you want virality, you can make short, informative videos like the kind made by Buzzfeed. How do actual customers use your products? Interviewing users and sharing their stories can be a great source of video content. Get in touch with your customers and ask if you can feature them on your channel. Many will wholeheartedly agree (especially if you offer to promote their business/blog in the video). Either ask them to come into your studio, or interview them in their home/office. This is a great branding tool and also works as a customer testimonial. This is exactly how YouTube e-commerce works. Lastly, your YouTube channel shouldn’t be limited to your own video content. It should also share content made by others, particularly video reviews made by other vloggers. You can usually find such reviews by searching for your product name on YouTube. Asking the vlogger if you can feature the review on your channel is another way of how to sell on YouTube. Most will be happy to see their content spread further. The next step after making the video is to direct the video traffic to your site or landing page. Fortunately, YouTube offers multiple methods to let users interact with your video content. Let’s look at some of these. 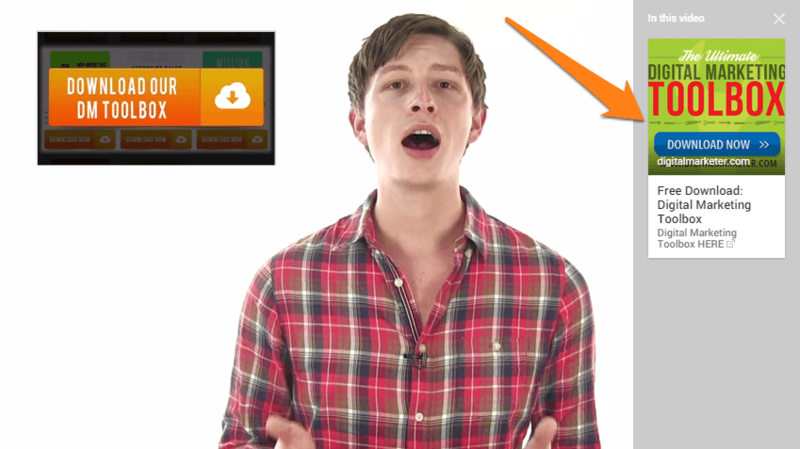 An annotation at the beginning, middle and end of the video linking to a landing page. An annotation linking to your website on the logo. An annotation to any similar videos on your channel. The video description is often overlooked as a method to get leads and clicks. This description should include multiple links to your landing page, along with an actual description of the video. Make sure to use keywords here (don’t overuse them) to get SEO benefits as well. Cards are a recent addition to YouTube’s arsenal of marketing tools. These are interactive elements that can be inserted inside a video to do different things — show products, websites, other videos, and even raise funds directly from the video. Check out Google’s help section to see what kind of card is right for you, and how to use it. Once you’ve made your videos and uploaded them to YouTube, it’s time to promote your channel. YouTube comments are often disparaged online for their poor quality, but for the entrepreneur, they can often be a great source of viewers. Engaging with the community and answering their questions will go a long way in promoting your brand. Try to answer comments made on not just your own videos, but also videos on similar topics made by other vloggers. For example, if you sell fitness accessories, find videos on fitness and diet related topics and respond to comments on them. Don’t push your products aggressively. Instead, drop hints that the commenter can learn more about the topic on your channel. Remember: your first task is to be helpful. Selling comes much later! As we’ve already mentioned before, YouTube is the second largest search engine in the world. It also dominates Google searches, with video showing up in 55% of search results, and YouTube accounting for 82% of all those videos. Make videos on video keywords. These are keywords that have a large number of video results in Google (at least 2+) witch leads to more sales. Use these keywords in your video title. Also make sure to name your video file with some keywords. For example, if your video is on how to sell on YouTube, the file name and title could be how-sell-youtube.mp4 and How to Sell on YouTube — A Step by Step Guide respectively. Use SEO-optimized descriptions. The short and long description below your video have a big impact on SEO. Google uses these descriptions to understand what your video is all about. 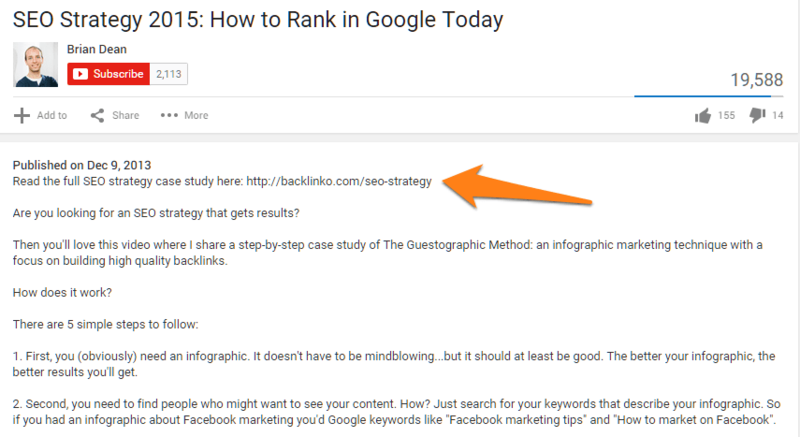 Make sure to add at least 200+ words of keyword-rich content describing the video in this section. Take a look at these YouTube ranking factors to better understand what affects your video rankings. For the most part, it is a combination of the quality of your content (higher engagement = better rankings), your channel authority, and video SEO. Embedding your content on other platforms (a blog, Facebook, Google+, etc.) is another great way to develope YouTube e-commerce. Message Facebook pages and Twitter accounts in your niche and ask them to share your videos. Many such pages are looking for quality content and will be happy to send out your video, often for free. If your content is newsworthy, contact blogs and news outlets such as HuffingtonPost, Buzzfeed, etc. to share your video. For keyword related content, ask people with text-only content on the topic to embed your video in their content. Share your YouTube channel link on product invoices and packaging. Share your video on niche community forums and websites such as Reddit. While you’re busy promoting your videos on other platforms, don’t forget to market yourself on YouTube as well. Create SEO-optimized playlists. These often show up in the Related Videos pane and can get your additional views. Create a separate segment asking people to subscribe to your channel. Insert this segment at the end of every video with an annotation pointing to the subscribe button. Brand your channel. Use a brand image in your channel header and fill up the About section with information about your brand. If you do all of the above, you’ll find that getting traffic to your YouTube videos is not only easy, but also fun. Selling on YouTube should be seen as a long-term process. Don’t expect overnight results. Instead, invest in it over months and nurture an audience. Your main aim should be to help people. Whatever sales you can get will come organically through your brand authority.